The objective of accreditation is to ensure that Universities meet certain standards of quality in the education they provide to students. 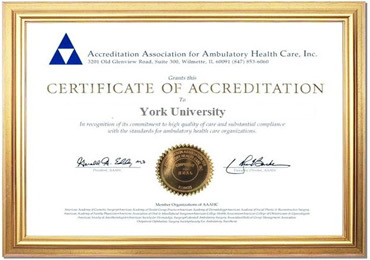 York University has successfully met all of the AAAHC's accreditation requirements and has, therefore, been awarded Full Accreditation by the AAAHC after being evaluated on the agency's standards of the global best practices in Health Education and Promotion, Sport Medicine, Health Services, and Public Health. AAAHC's full accreditation is proof of Test Institute's commitment to providing an education that is on par with global standards.. While accreditation is not always a mandatory step to on-line universities based in the US, York University’s board is always working hard to continuously improve the accreditation and recognition status of this prestigious international academic institution. 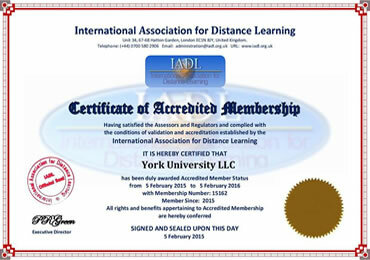 That’s why; the board and the president have always sought recognition and international affiliation with a variety of international academic institutions of high caliber, thereby abiding to their sophisticated criteria and regulations, to add more recognition and accreditation to York’s programs while, at the same time, trying to benefit from their professionalism and academic history. Please note that, YORK UNIVERSITY IS NOT ACCREDITED BY AN ACCREDITING AGENCY RECOGNIZED BY THE UNITED STATES SECRETARY OF EDUCATION. 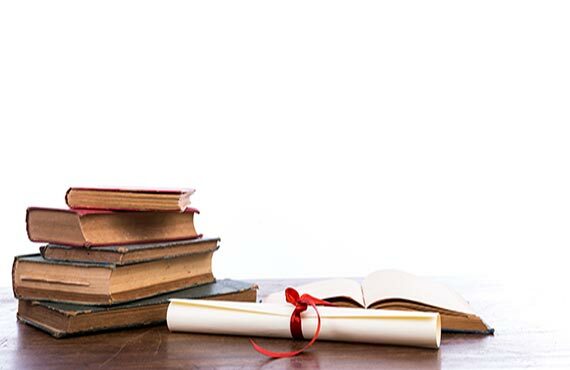 York University offers a high quality cost effective student friendly education. There is no distinction between the programs offered through York University and those of traditional campus based programs with regards to the following: the diploma, transcript and other graduation documents from York University follow the same standard used by all US colleges and universities. York University graduation documents can include an apostil and authentication from the US Department of State to facilitate their use internationally. However, York University will not stop here; our board of directors, headed by our highly qualified president, is always working hard to add more recognition and accreditation to York University in the United States as well as all over the world. So, welcome to a continuously improving institution, where quality and international perspective join hands to offer you the best from your global academic exposure.